Chicago teachers began walking the picket line for the first time in 25 years Monday morning at the nation’s third largest school system, leaving parents to scramble for alternatives for their children. 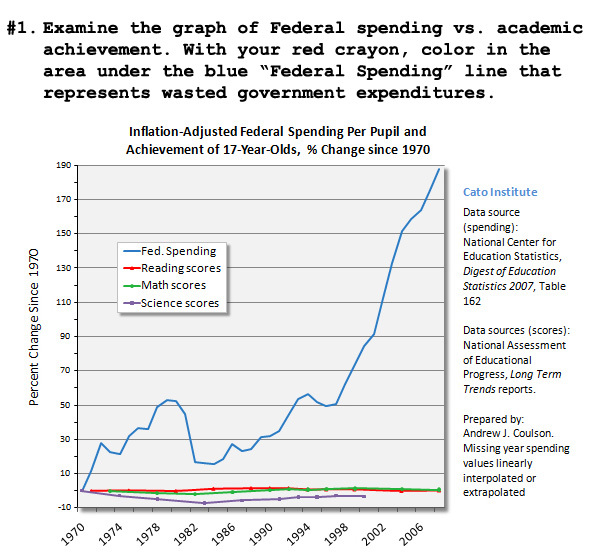 Examine the graph of Federal spending vs. academic achievement. With your red crayon, color in the area under the blue “Federal Spending” line that represents wasted government expenditures. The graph is from Cato@Liberty and perfectly captures the reason why the Department of Education must be closed down. Simply put, academic outcome is unaffected by Federal education spending.